Andreas was born in Holland on June 10, 1933. He was the oldest of 11 children. His family owned a sizeable vegetable farm and after enduring years of hardship during World War II, they chose to leave their comfortable lifestyle and their family business in the old country. They left with nothing but the clothes on their backs in order to make a new start in America with freedom and opportunity as their partners. Andreas and his family – father, mother, and 11 children – immigrated to the United States in 1948. The Dutch government at that time would not allow asset removal from the Netherlands, so a family immigrating in those days needed to be sponsored by someone in the US so they wouldn’t be a burden to the nation. This sponsorship needed to be worked off, and Andreas and his father were the only ones in the family capable of doing this. Thus began the long journey of fulfilling the American Dream, a dream where anything is possible. Upon arrival in the United States, Andreas was separated from his family and brought to a dairy farm to start working off their sponsorship. After approximately four months of working and being extremely homesick, he was brought back to his family. He was 15 years old. After that, he worked in construction building homes. His father worked at a lumber yard and made $38 per week. It was hard for such a large family to start out with nothing, but each year things got better. In 1949, a Jewish cow dealer helped the family buy 40 cows and got them started on a small farm in New Egypt, New Jersey. They raised their own feed for the cows, making their operation self-sufficient. The following summer they planted 10 acres of tomatoes for Campbell’s Soup to make some extra money. They started leasing more ground around them and by 1953, with much hard work and the whole family helping out, they were able to expand to approximately 500 acres of corn and soybeans. Both 1953 and 1954 were big years for the Den Hoed family. In the summer of 1953, Andreas’ parents took a trip to visit family members in Sunnyside, Washington. They loved the climate and the mountains and saw the opportunity to grow different crops. Their description of Washington excited Andreas and the rest of the family, and they started making plans to sell their farm in New Jersey and move out west. 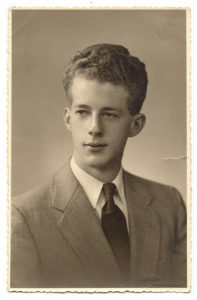 During this same summer (1953), Andreas went back to the Netherlands to visit a girl he had been sweet on since grade school. Marie Christina Kranendonk was her name, and to Andreas there was never anyone else he had ever considered spending the rest of his life with. Andreas stayed for 6 weeks using the family funds left behind by his father when they immigrated. Andreas asked for Marie’s hand in marriage on her 20th birthday, September 23, 1953. She accepted his proposal and Andreas flew home to the United States a happy man. Andreas, his father, and his younger brother went back to Washington the following summer with the intent of buying a farm. They hauled some farm equipment and some furniture with them. After surveying the possibilities, they purchased a farm with 360 acres north of Grandview in the Yakima Valley. Andreas and his father left his younger brother in Washington to work on their new farm. They wasted no time in returning to New Jersey. They still had to harvest 500 acres of corn and soybeans with a 2 row harvester, sell their farm, pack up all their belongings including equipment, and make it back to Washington in order to get ready for the spring of 1955. They finished their harvest in December of 1954 and loaded up two trucks with tractors and equipment. They headed to Washington with the older boys driving the two trucks and their father following behind them with the younger boys in the car. Their mother and the girls took the train. They took the southern route to avoid the snow. Having no freeways, the trip took 13 days of steady driving. Upon arriving in Washington, they started right in on building some corrals and a small milking parlor. They purchased 50 cows and were milking by the end of January 1955. In February, Andreas headed back to New Jersey. His fiancée Marie had gotten her paperwork in order and was on a ship called the Maasdam, heading his way. 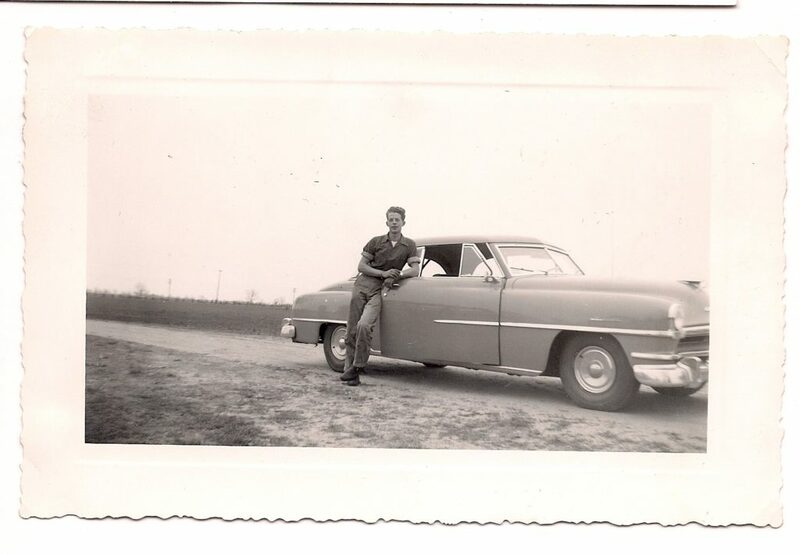 He went to pick her up in his brother’s 1949 Ford Coupe. With no freeways and no snow tires, Andreas recalls this being quite an adventure. It was a trip he will never forget. The Den Hoeds were eager to try out the new crops they could grow in Washington, so that first year they planted potatoes and seed alfalfa along with the crops needed to feed their cows. In 1956, the Den Hoed family planted their first vineyard. Andreas and Marie were married on July 18, 1956 in a small church in Sunnyside, Washington. Shortly thereafter, much to their dismay, Andreas was drafted into the Army. He served his new country for two years. In 1958 he was discharged and started working part time for himself. By purchasing an old tractor and borrowing his father’s equipment, he was able to get started on his own. The next year a local bank in Grandview loaned him $10,000. He struggled to pay back his loans for several years, but then he started raising mint, which was a good crop for him. Once Andreas had the resources to plant more vineyards on his own, he never stopped. Almost every year he would expand his acreage. In 1988 he made two of his sons (Bill and Andy) partners in a new project he was developing. Again the bulk of the acreage was planted to vineyards. As partners, the father and sons team were content to expand in the Yakima Valley for the next 5-6 years. But they became restless and wanted to find the ultimate piece of property to showcase Washington’s ability to compete in the world market of ultra-premium wine. After several years of searching, in 1997, they purchased a 550-acre parcel of land bordering the Columbia River in the Wallula Gap. Some say this vineyard site has no rival. What has become apparent with the wines produced from this vineyard is that they will stand the test of time and hold their own against the best wines of the new world. Andreas has fulfilled his American Dream.